Today is the International Day Against Homophobia and Transphobia and I was due to make a speech. 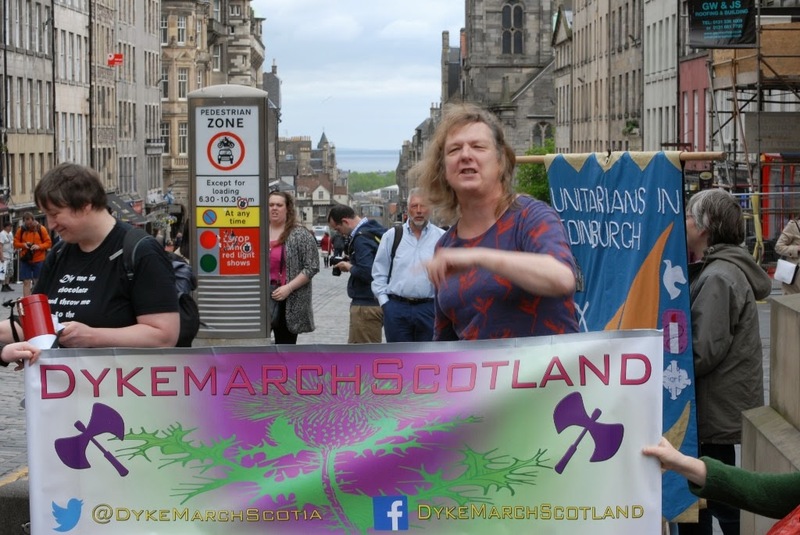 One of the events happening in Edinburgh was the First Scottish Dyke March and I agreed to speak at the start of it. I felt nervous about it, and found myself secretly hoping it had been cancelled. But it wasn’t, and my dear heart gave a little leap of fear when I saw the group and the police standing up the hill by Adam Smith. We are great people now! You have a statue on the High Street! Did you know that? Outside the law courts. I’ve got a statue too. And now. If you’ll forgive me. I will go and get buggered. And maybe something of the insight about men in that comes from the incident I told in my speech. As soon as I stood up, of course, all my nerves disappeared.I didn’t use the loudhailer, because I hate them; I accessed my male voice and I projected. I was just beginning transition and I was so delighted. I loved him calling me ‘madam’. Only then he looked at me again and started to apologise. There he was, telling me how sorry he was. Over and over again; and I couldn’t understand why, until it finally occurred to me that after reading me as a woman he was now reading me as a man. And he was apologising because for many men there is no worse insult you give a man that treat him him as a woman. Or call him one. It was one of those moments when I was so glad to be trans; because the misogyny is so prevalent in our society that it mostly remains hidden below sight and we cannot se it. But this was one of those moments when it came to the surface, and I could see it. And understand also that I had internalised this misogyny as a boy, without realising it, and it was the main reason I was so frightened and so ashamed of the woman within me. Because it’s no coincidence that the countries which treat women the worst are also the countries that treat LGBT people the worst too. And the fight for trans rights, especially, and for women’s rights, too, go hand in hand. Often the hostility and abuse we encounter is so profound and so dangerous that we are forced to conceal who we are. And how wonderful that here today we can be visible and defiant together. I want to dedicate this moment, standing here with you all, to those sad men of the Scottish Defence League who are apparently gathering at Waverley station. And to the man who was so busy staring at me and my partner as we walked along hand in hand that he tripped over a dustbin. Not to mention the man who was so busy staring at me and my daughter walking along together that he drove his car into a brick wall. And here’s me, urging my audience to march to the barricades. I don’t think I’ve ever spoken quite like that before. It amazed me. And my legs, which were so sore when I nervously set out in the morning, now carried me right on the march to its end.